Dr. Stephen Scionti has combined his years of experience in performing HIFU treatment for prostate cancer with his advanced understanding of prostate MRI to develop the most sophisticated prostate cancer HIFU treatment in use today. 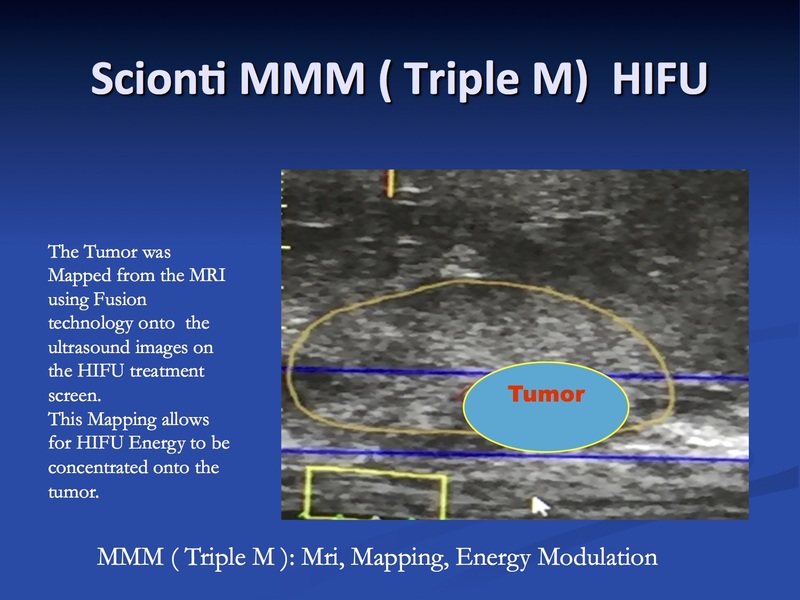 The Scionti Triple M HIFU technique combines advanced MRI tumor Mapping that reveals the location of high grade tumors in the prostate with sophisticated MRI to Ultrasound Fusion software embedded in the HIFU machine to precisely deliver higher doses of focused ultrasound energy to the worst tumor regions of the prostate , while delivering lower energy dosages to the surrounding prostate tissues. This highly sophisticated technique results in effective destruction of dangerous tumor regions in the prostate while preserving healthy prostate tissues and greatly reducing the risks of urinary and sexual side effects. In the standard HIFU treatment, the HIFU physician will treat the entire prostate or sometimes simply just treat only the cancerous half of the prostate without a road map as to where the tumor is actually located in the prostate gland. An equal amount of energy is simply applied across the prostate gland, without any guidance as to where the aggressive tumor is actually located within the prostate. This approach can lead to under treatment of the tumor and over treatment of healthy prostate tissues and important associated structures such as the urethra, bladder neck, external sphincter or neurovascular bundles. A multi parametric MRI of the prostate is obtained and the tumor regions are delineated based on MRI image information , combined with biopsy information. I then use sophisticated software to create a 3D model of the prostate with the tumor locations embedded. This “virtual” 3D prostate model is then loaded into the HIFU treatment machine prior to the HIFU treatment. The MRI derived prostate model is then fused or registered precisely onto 3D ultrasound images obtained during the HIFU procedure using highly advanced software. This MRI Mapping technique allows me to see the actual tumor location on the ultrasound planning screens f the HIFU machine. In the standard HIFU treatment, this is NOT done and the HIFU doctor has no information as to where the cancer is located. This MRI Mapped 3 D tumor location is then used to Modulate energy: higher dosage and repeat applications of energy are applied to the significant tumor and lower dosages of energy are applied to surrounding tissues. Precise MRI mapping allows the important neighboring structures to be avoided while effectively killing the dangerous tumor. The Scionti MMM HIFU requires advanced MRI Imaging, advanced MRI planning software, MRI Fusion software embedded into the HIFU machine and significant experience!